Golf Organizer Deluxe is for GOLF funs, enthusiasts, and players. Organize, manage, catalog golf data. Organizer deluxe comes with pre- designed templates that include: PLAYER: organize players information, STAR: create champion diaries, Tournaments: enter results, WEB: includes top web golf resources. Organizer is easy-to-use for the beginner, at the same moment feature - reach and powerful enough to satisfy the most advanced users. For the power user, Golf Organizer affords the simplicity of wizards that make it easy to set up and use the organizers that you create. 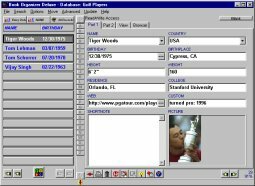 Golf Organizer gives the user total control over the structure of the database, and the way data appears in data-collection screens and on labels and reports. * Organizer Designer / Customize Your Database - You can easily modify templates included in the program. * Web Ready - Web Ready features give you the ability to do simple things like sending e-mail and launching web pages from within the program, to complex things like viewing your data and images in web page format. * Flexible Templates - Results of time consuming tasks or repetitive processes can be saved into templates. Qweas is providing links to Golf Organizer Deluxe 3.7 as a courtesy, and makes no representations regarding Golf Organizer Deluxe or any other applications or any information related thereto. Any questions, complaints or claims regarding this application Golf Organizer Deluxe 3.7 must be directed to the appropriate software vendor. You may click the publisher link of Golf Organizer Deluxe on the top of this page to get more details about the vendor.